Click here for Nickelodeon USA's December 2018 highlights! Check out Nickelodeon USA's October 2018 highlights at http://bit.ly/oct18onnick! 12:30pm on NICK - Butterbean’s Café: Fairy Happy Thanksgiving!/Cricket’s the Boss! In celebration of Thanksgiving, TeenNick will host Watch-a-thons all weekend long airing episodes of Nick’s hit series Game Shakers (Nov. 22), Nicky, Ricky, Dicky & Dawn (Nov. 23) and Victorious (Nov. 25), from 6:00 a.m. – 10:00 p.m. (ET/PT). On Nov. 24, the net will air a Watch-a-thon of The Thundermans from 6:00 a.m. – 6:00 p.m. The Fairly OddParents will take over Nicktoons Thanksgiving weekend with episodes airing from 6:00 a.m. – 10:00 p.m. (ET/PT). Nick at Nite will join in on the Thanksgiving festivities with holiday-themed episodes of Friends airing from 10:00 p.m. – 12:00 a.m. (ET/PT). Get ready for your chance to win amazing prizes when Nickelodeon Trivia Prizefest returns this November! Tune into Nickelodeon USA every Saturday throughout November 2018 to catch your favorite Nick shows, and play-along by answering tricky trivia questions online at http://www.nickprizefest.com/ to enter the sweepstakes to win EPIC prizes! Greenlit for an initial 20 episodes, Cousins For Life comes from veteran creators and executive producers Kevin Kopelow and Heath Seifert (Austin & Ally, All That), and centers on 12-year-old cousins Stuart (Dallas Young) and Ivy (Scarlet Spencer), best friends who come from very different backgrounds, who have to learn to navigate life under one roof with their families. After Stuart’s mom is deployed overseas, his fun-loving dad Clark (Ishmel Sahid) decides to move the family to Portland to live with his uptight brother Lewis (Ron G.) and his family, which includes Stuart’s confident, socially active cousin Ivy and her younger, overly-curious brother Leaf (Micah Abbey). Now living in a brand new city, Stuart embarks on a variety of endeavors with Ivy that lead to hilarious adventures. Although the cousins do not always see eye-to-eye, Ivy and Stuart learn they are better together, and when they team up, they are unstoppable. 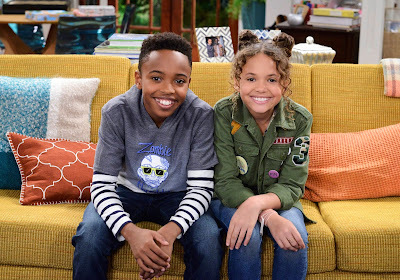 The series will also feature Emma Shannon (Black-ish) as Millie. Saturday, December 1 at 9:30am - Al Be Back: Albearto and his animatronic army interrupt the Turtles' first public musical gig. Following "Team Kel vs. Team Kenan", Double Dare will return with more brand-new episodes in 2019! Friday, November 9 at 7:00pm - Candy Store, Colorful Arcade, 4th of July Party! : Three JoJo Siwa super fans get the chance to sync to some of her biggest hits. Nick Cannon and JoJo Siwa host with a very special appearance by BowBow. Thursday, November 22 at 5:30pm - A Loud Family Vacation: Celebrating with Lincoln and the gang; nothing screams vacation like a Loud Family Vacation. Also starring: Andy Samberg (Brooklyn 99), Kevin James (The King of Queens), Fran Drescher (The Nanny), Steve Buscemi (Con Air), Molly Shannon, David Spade (Just Shoot Me, Rules of Engagement), CeeLo Green (How to Rock), Jon Lovitz, Brian George, Luenell, Brian Stack, and Chris Parnell (As Told by Ginger, Glenn Martin DDS, Bad Seeds). Game on! Watch as kids all over the country compete for Minecraft glory on Nickelodeon’s newest digital series, Minecraft City Champs! Friday, November 9: The Loud House 🆚 The Casagrandes Family Quiz! | Which Fam is Yours? Friday, November 16: Thanksgiving Pranks 🦃 Ft. JoJo Siwa, Jace Norman & More! Friday, November 23: Top 25 Nick Family Moments Ft. The Thundermans, Henry Danger & More! Saturday, November 12 - Episode 3: Jace Norman & Henry Danger Cast Share a Week on Set! Saturday, November 17 - Episode 4: GIRL POWER on the Set of Henry Danger! Saturday, November 24 - Episode 5: FOOD & SNACKS on the Henry Danger Set! Tuesday, November 13 - Episode 2: Is the Purple Doctor Fish A Medical Maniac?! Tuesday, November 20 - Episode 3: Is Harold a Ticking Timebomb?! Sunday, November 4: Celebrate Nick Birthdays & Play What’s In The Box w/ Jace Norman, JoJo Siwa, SpongeBob & More! Butterbean’s Café - Brand New Show! Get ready to be whisked away with Butterbean’s Café, Nickelodeon's brand-new animated preschool series about a fairy named Butterbean and her adventures running a neighborhood café and magical bakery, premiering Monday 12th November 2018, only on Nick Jr. on Nickelodeon USA! Click here to learn more about Butterbean’s Café! Monday, November 12th at 10:30am - 12:00pm: "Ultimate Rescue"
Rainbow Rangers - Brand New Show! Premiering Monday, November 5 on Nick Jr., the Rainbow Rangers series follows the thrilling rescue-based adventures of seven 9-year-old girls who are Earth’s first responders, protecting people, animals, resources, and the natural beauty of our world. 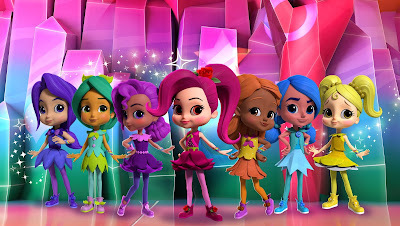 The Rainbow Rangers, who live in the magical land of Kaleidoscopia at the other side of the rainbow, have their own distinctive personalities and superpowers. Whenever there’s trouble for the people or animals of Earth, our seven heroines zoom into action and ride their Spectra Scooters across the rainbow to save the day. Click here to learn more about Rainbow Rangers! Thursday, November 1 at 3:00pm - The Courage Carriage: After a display of true courage, Trinket receives a sparkling new carriage from the Unicorn of the Lake. Friday, November 2 - Stick with Me; Happy Pinecone Day: Becca and Beatrice get stuck together; The Bunch tries to photograph the Pinecone Bunny. Monday, November 26 - Merry Woodsmas: Becca and the Bunch search for the perfect present to give to Santa. The Bureau of Magical Things - New Show! Your favorite pizza-loving heroes return in an epic new adventure loaded with wall-to-wall laughs that critics call “the best Ninja Turtles movie ever” (Eric Walkuski, JoBlo.com)! In Teenage Mutant Ninja Turtles: Out Of The Shadows, Raphael, Leonardo, Donatello, and Michelangelo are back to battle bigger, badder villains, alongside April O’Neil and a newcomer: the hockey-masked vigilante Casey Jones. After supervillain Shredder escapes custody, he joins forces with two dimwitted henchmen, Bebop and Rocksteady, to unleash a diabolical plan to take over the world. As the Turtles prepare to take on Shredder and his new crew, they find themselves facing an even greater threat with similar intentions: the notorious Krang. Out Of The Shadows will also feature fan favourites such as Karai and the evil humanoid fly scientist Baxter Stockman. Hailed as “fun from start to finish” (Brian Medina, Movie Pilot), Teenage Mutant Ninja Turtles: Out Of The Shadows stars Megan Fox, Will Arnett, Laura Linney, Stephen Amell, and Tyler Perry in the live action film that is fun for the whole family. Teenage Mutant Ninja Turtles: Out Of The Shadows stars Noel Fisher as Michelangelo, Jeremy Howard as Donatello, Pete Ploszek as Leonardo, Alan Ritchson as Raphael, Megan Fox as April O'Neil, Will Arnett as Vernon Fenwick, Laura Linney as Chief Vincent, Stephen Amell as Casey Jones, Tyler Perry as Baxter Stockman, Brian Tee as Shredder, Stephen Farrelly as Rocksteady (as Sheamus), Gary Anthony Williams as Bebop, Peter Donald Badalamenti II as Splinter (as Peter D. Badalementi), Tony Shalhoub as the Voice of Splinter, Brad Garrett (Everybody Loves Raymond) as the voice of Krang, Brittany Ishibashi as Karai, Courtney L. Kirkland as a Referee, Justin van Duyne as a Referee, Joslyn Brewster as Bumblebee, Robert Clohessy as Deputy Warden Hamlett, Alexis Suarez as a Officer, John Palladino as a Officer, Meredith Travers as a Schoolgirl, Edwin J. Birmingham as NYPD ESU, Paul Teutul Jr. as a Corrections Officer (as Paul Michael Teutul), Opal Alladin as a Security Officer, Connor Fox as Trevor, Stan Demidoff as a Uniformed Cop, Greg Hildreth as a Security Guard, Dean Winters as a Bartender, Antoinette Kalaj as a Hostess, Alice Callahan as a Detective, Jane Wu as Jade, Steve Lacy as a News Anchor, and cameos from Jill Martin, Alessandra Ambrosio, Carmelo Anthony, DeAndre Jordan, Jonathan Redick, Matt Barnes, Austin Rivers, Shane Larkin, Lou Amundson, Andrea Bargnani, Quincy Acy, and Langston Arnold Galloway, plus a special appearance by Teenage Mutant Ninja Turtles co-creator Kevin Eastman as a Pizza Delivery Guy. Originally posted: Sunday, October 21, 2018 at 8:54pm BST. Based on a list compiled by Anime Superhero Forum members; Sources: Zap2it TV Listings, TheFutonCritic.com; Additional sources: @TVShowsFan, Knight Squad Wiki, Power Rangers NOW (via @T1m3R_FR), @TheAGames10, @VincentWaller72, Wikipedia, @Magitroopa, The Cable Forum. Follow NickALive! 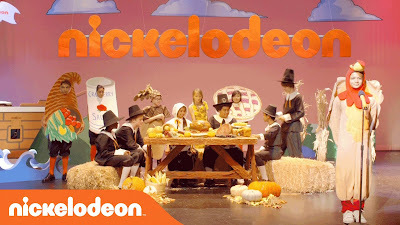 on Twitter, Tumblr, Google+, via RSS, on Instagram, and/or Facebook for the latest Thanksgiving on Nickelodeon, TeenNick, Nicktoons, Nick Jr., NickSplat, Nick at Nite and TV Land News and Highlights!